What should you do in LA if you only have 1 day to spend? This one-day driving tour will give you a glimpse of the top LA sights from Hollywood to Venice Beach. It assumes you have your own car or a rental car for the day. If it's summer, start in Hollywood to end up in Venice for sunset on the beach. If it's winter and the sun is setting at 4 pm, do the tour in reverse and start at the beach, ending in Hollywood after dark. If you don't have a car available, you can also book a Hop On-Hop Off City Sightseeing Tour to visit most of the same locations without the driving. If you don't get out of the car, the drive alone takes about 1 and a half to two and a half hours, depending on traffic, but you can get out and take a look at many different stops and still do this route in a day. So let's get started exploring Hollywood! We wouldn't necessarily recommend staying at the Hollywood Roosevelt Hotel, but it's worth taking a look inside at this historic Hollywood landmark, and it makes a good starting reference. Start your morning with breakfast at Mel's Drive-In, one block east on Highland just south of Hollywood Blvd, or grab a bagel at the Coffee Bean and Tea Leaf across from the hotel, then cross the street to compare your hand and footprints to your favorite stars in the forecourt at TCL (Grauman's) Chinese Theatre. Not much in the Hollywood & Highland shopping center next door will be open before 10 or 11 a.m., but walk across the front of the complex past the Dolby Theatre where the Oscars are held to the staircase leading up to the Babylon Courtyard. Don't forget to look down at the Hollywood Walk of Fame as you're walking to see if your favorite entertainers' stars are on this block. You can take the escalator up to the Babylon Courtyard, but then you won't get a chance to admire how the architects managed to frame a view of the Hollywood Sign as you ascend the center of the staircase. The Courtyard itself looks like a Hollywood set with giant elephant sculptures perched high above the three-level ring of shops. Make your way up to the viewing bridges at the back of the courtyard via stairways or escalators on either side for your photo opportunity with the Hollywood Sign and Hollywood Hills as a backdrop. You can also see the Hollywood Methodist Church with its red ribbon painted on the tower. In the 1943 movie War of the Worlds,​ terrified citizens took refuge in this church from attacking aliens. Head back to your car and drive east on Hollywood Blvd, past some of Hollywood's other landmarks. The El Capitan Theatre and Disney Entertainment Center opposite Hollywood & Highland was restored by the Disney Company to its previous glory. The Jimmy Kimmel Live! show is taped in the Entertainment Center, while Disney films are screened at next door El Capitan with pre-show visits by costumed movie characters. The Ghirardelli Soda Fountain and Disney Studio Store shares the building. On the next block, next to the dinosaur-topped Ripley's Believe It or Not, just down Highland, you can see the pink and green art deco façade of the original Max Factor factory, which now houses the Hollywood Museum. Continuing east, on your right you will pass the American Cinematheque at the historic Egyptian Theatre and the Art Deco Hollywood icon that was originally Kress Department store. It spent a long time as Frederick’s of Hollywood before being converted to a short-lived restaurant and nightclub. Hollywood's oldest restaurant, Musso & Frank Grill will be on your left. 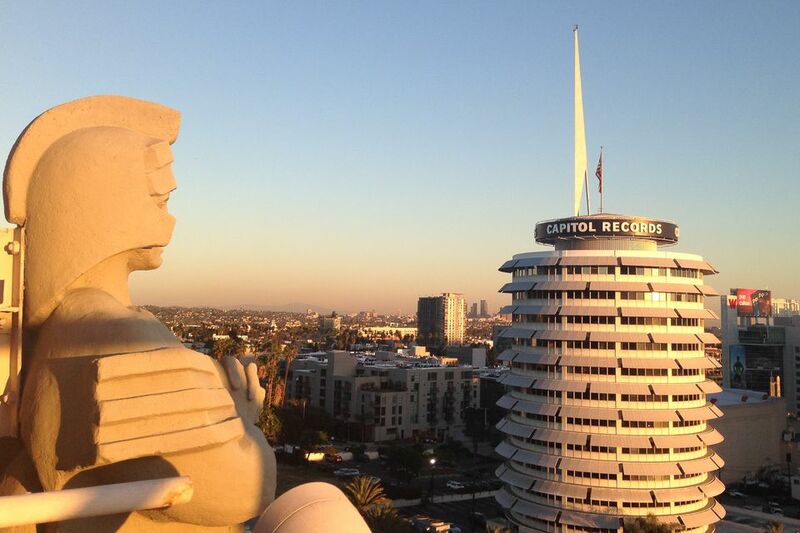 At Hollywood and Vine, you can look for metered street parking to stop and take a photo of the circular tower of the Capitol Records building, the Hollywood and Vine signs and sky trackers and another view of the Hollywood Sign or you can look left at them as you turn right down Vine Street. Either way, when you're ready, head south (away from the hills) on Vine Street, then turn right on Sunset Boulevard. The half-golf-ball Cinerama Dome is on your left. Amoeba Music, at Ivar, is THE place to shop for hard-to-find music including a vast collection of recordings on vinyl and tape. Following are two different routes to take you west to the ocean, depending on what you would like to see. Route A takes you west by Museum Row on the Miracle Mile and the La Brea Tar Pits, if you're interested in pre-historic saber tooth cats and mammoths. Route B is west via the Sunset Strip in West Hollywood. Continue down Sunset to La Brea. Turn left on La Brea until you get to Wilshire (about 2 miles). Turn right on Wilshire. You're entering the Museum Row on the Miracle Mile, which includes the Craft and Folk Art Museum, the striking Petersen Automotive Museum - whose shiny steal ribbons over red surface look like a car rounding the corner from across the street - and the many buildings of the LA County Museum of Art. As you pass Curson, look for metered parking on the right in front of Hancock Park near the Page Museum and the La Brea Tar Pits. If there is no parking available on Wilshire, turn right on Fairfax and right on 6th Street to park on the other side of the park or park in one of the pay lots. There are entrance gates from 6th Street and from Wilshire, but the biggest tar pits are near the Wilshire entrance. Optional Detour: If you're ready for lunch head up Fairfax to 3rd Street to the LA Farmer's Market to grab a bite at one of the many food vendors in this permanent market building. If you finish lunch quickly, you might have time to stroll next door for some shopping or celebrity spotting at The Grove. Continue west on Wilshire to Rodeo Drive. Instead of turning left at La Brea, continue on Sunset through West Hollywood on the famed Sunset Strip. You'll pass the Comedy Store and Laugh Factory where many famous comics got their start. You'll also pass some of LA's most revered live rock n' roll venues, the Viper Room, the Whiskey A-Go-Go, and the Roxy. West Hollywood usually has an interesting collection of quirky billboards soaring above the sidewalk cafes, bars and shops that line the streets. Entering Beverly Hills, Sunset becomes a windy road with green hedges and trees blocking your view of most of the mansions tucked behind them. You'll pass the famed Beverly Hills Hotel on the right. You can turn left off of Sunset for a detour down famed Rodeo Drive which is at a 6-way intersection crossing Sunset at the same place as Cañon Drive. From Sunset, turn left and proceed through several blocks of well-groomed mansions before you arrive at the short stretch of high-end designer boutiques recognized around the world. Rodeo Drive dead ends into the Four Seasons Beverly Wilshire Hotel on Wilshire Blvd. You can either go around the block and go back up to Sunset or turn right on Wilshire and head west toward the Beach. If you're already on Wilshire, continue West to Rodeo Drive, which only goes to the right. Metered parking is available on Rodeo and surrounding streets, and some parking structures have an hour or 2 of free parking if you want to get out and walk around. If you happen to be here between 3 and 6 in the afternoon, stop by McCormick and Schmick's at the top of the Via Rodeo pedestrian walkway at the Wilshire end of Rodeo Drive for their happy hour food specials. The designer shops only occupy three blocks, then Rodeo becomes a wide boulevard passing through a Beverly Hills neighborhood of multi-million-dollar mansions all the way back up to Sunset Blvd. Turn Left on Sunset heading west. Sunset is a winding green route to the beach. Wilshire is an urban landscape of retail and commercial buildings with a green stretch through the L.A. Country Club. If you want to take the Wilshire route, turn right at the Sunset 6-way intersection down Cañon Drive, then veer right at the next block on Beverly Drive, just to give you a different view back down to Wilshire, where you’ll turn right and pass Rodeo Drive again on your way to the beach. If you're in any kind of a hurry, the Wilshire route is usually slower, but they'll both be pretty leisurely. If you take Sunset, you'll drive by UCLA on the left. You can detour through campus if you're interested. It's a beautiful campus. Beyond UCLA, after you pass Will Rogers State Historic Park veer left on Chautauqua as Sunset veers right. (If you miss Chautauqua, Sunset goes all the way to the beach, but it will add several additional curvy miles to the route.) Chautauqua will take you down to the ocean, where you will turn left on Pacific Coast Highway (known locally as PCH). PCH is a limited-access highway as it comes into Santa Monica. Take a slight left from PCH onto California Incline, which is basically a left-exiting off-ramp from PCH to Ocean Blvd, where you will turn right for a few blocks before turning left on Broadway and right into the parking structure adjacent to the Santa Monica Place Mall. Alternately, if you miss California Incline, you can stay in the right lane and follow the signs to take the middle exit on Moomat Ahiko Way (as PCH turns left and Appian Way goes straight), then turn left on Ocean and right on Broadway to the parking structure. If you miss the curve and end up on Appian Way, take the next left up to Ocean. Be sure to stay right and NOT follow the Pacific Coast Highway or you'll end up on the freeway. If that does happen, take the first exit, Lincoln, turn left on Lincoln back to Colorado Ave, then take a left back to the beach. The parking structure will be on your right after 4th street. Parking structures 7 and 8 adjacent to the mall have free ​90-minute parking, $1 for the next hour and $1.50 per 30 minutes after that. The lower floors are 3 hours only. A few other downtown lots have the same rates. There is also parking at the Civic Center, or there are multiple pay lots at the beach and short-term metered street parking. Take Wilshire through Beverly Hills and Century City, into Santa Monica to 4th Street; turn left on 4th. Turn Right on Broadway and left into the Santa Monica Place parking structure. Alternately, if you're running late and it's not rush hour, you can take Wilshire to the 405 Freeway South, exit to the 10 Freeway west, exit 4th Street at the end of the freeway. Follow the sign for 4th Street, then turn left off of 4th onto Broadway and into the parking structure. Parking is free in the Santa Monica Place parking structure for the first 90 minutes, as are other city parking structures in the vicinity. If you are in need of a restroom, there are public restrooms at the shopping center. From Santa Monica Place or the parking structure, exit on foot toward Broadway and the Third Street Promenade. If you want to visit the Pier, turn left and walk down Broadway to Ocean. The Pier is one more block to the left at Colorado. The Santa Monica Pier has a Carousel, a solar-powered Ferris Wheel, a small roller coaster and a couple other rides at Pacific Park, as well as the Santa Monica Pier Aquarium, a Trapeze School, a fast food court and restaurants and some gift shops - and of course, a great view of the Pacific Ocean and Santa Monica Beach. There are summer concerts held on Thursdays at the foot of the pier adjacent to the on-pier parking lot. Third Street Promenade is lined with shops and restaurants and usually has an array of street performers, especially during summer and on weekends and evenings the rest of the year. For some budget designer snacks, head upstairs at the food court at 1315 Third Street Promenade and try a Wolfgang Puck Pizza. It's only budget compared to dining at Wolfgang Puck's other Santa Monica establishment, Chinois on Main. You can download this Walking Map of the Third Street Promenade. Retrieve your car from the parking structure at Santa Monica Place and make your way around the block to where Main Street starts on the other side of the Mall. Main Street will take you through an area of shops, galleries and restaurants as you cross over into Venice Beach. Proceed to the traffic circle at Windward and look for a reasonable place to park. There are a variety of parking lots in the neighborhood with prices ranging from $3 to $15 depending on the day and season. In the off-season, you may find street parking. If you're stopping for less than an hour, you may score a spot right there on Windward right by the beach. Don't forget to note your space and pay at the pay station mid-block. From Windward, walk to the right, down the boardwalk between the vendor stalls and the street performers past the outdoor gym at “Muscle Beach.” Walk about 7 short blocks to watch the sunset over a casual dinner at the Sidewalk Café. If you're all walked out already, there's a parking lot off the alley behind the Sidewalk Café just off of Clubhouse Ct. For those on an even tighter budget, grab a slice of pizza or a sausage sandwich at one of the Venice Beach snack bars and find a spot on a bench or a nice stretch of sand to enjoy the view. Bring a sweater or jacket. The beach is cool in the evening, even in summer. After dinner, you're close to the airport if you've got a red-eye flight to catch, or you can deadhead back to Hollywood and grab a drink at one of the Roosevelt's 6 bars or restaurants. If you're still standing, head out to one of LA's Top Dance Clubs or Comedy Clubs.